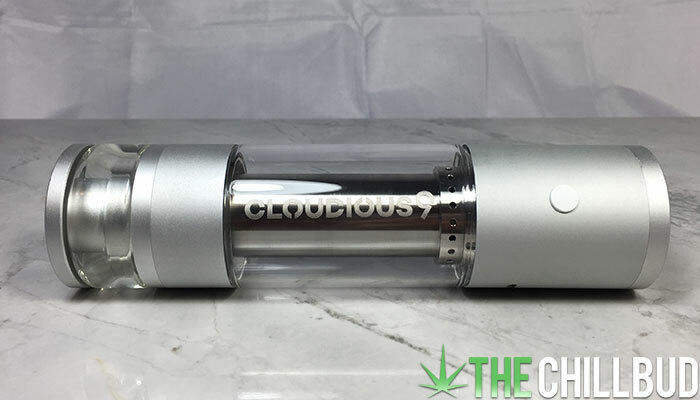 We’re giving you an exclusive first look at the Hydrology 9 vaporizer by Cloudious 9. The Hydrology 9 is a truly unique vaporizer that incorporates a water filtration system directly into the unit. The fact that his vaporizer looks like a lightsaber had a baby with a lava lamp is just an added bonus. The Hydrology 9 vaporizer is going to cost around the $250.00 mark, putting it in league with some of the industries finest models. Equipped with a deceptively large oven, plenty of LED indicator lights and 5-preset temperatures to cycle between, the Hydrology9 is a revolutionary vaporizer. I know what you’re saying, “a big oven, some LED’s and preset temperatures isn’t that exciting,” but wait, there’s more! Immediately after laying eyes on the Hydrology 9 you’ll recognize that you don’t recognize any bit of it. 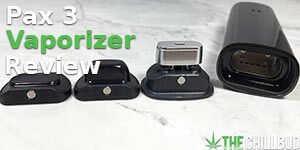 In a market full of vaporizers that are eerily similar to one and other, it’s incredibly refreshing to see a company creating something new and innovative. 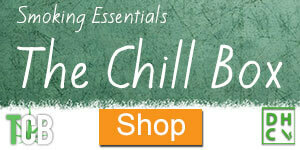 Aesthetically, this vaporizer will take your breath away. Before we get into all of the awesome features that make the Hydrology9 so unique, you should know that it’s large. Fully assembled it comes in at 7” tall with a diameter of about 1.5”. Yes it’s totally portable, but it isn’t something you’d throw in your pocket and take on a hike in the woods. This is the first vaporizer we’ve come across that uses on-board water filtration to cool the vapor, no extra accessories are necessary. Full disclosure, I did find that the unit leaked when I first got it. After reaching out to the helpful folks at Cloudious 9 they suggested I give it a gentle twist to tighten everything up, now everything’s water-tight and working perfectly. You may want to keep this in mind when you first get your Hydrology9 to be sure you don’t accidentally ruin any nearby electronics. The Hydrology 9 has two separate air intake vents that you can adjust to your personal preference. I really loved this feature because it seems so useful, yet almost no one else is doing it. Draw resistance is something extremely personal, some like more resistance, others (like me) want to haul with ease. A simple twist of the vent using the included tool will let you dial in the perfect draw. One of my absolute favorite things about the Hydrology 9 is the addition of a built-in stir stick. 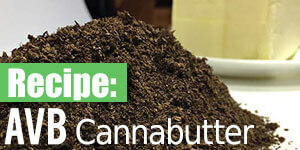 A dial at the bottom of the vaporizer allows users to mix up the herb in the oven without opening anything up. 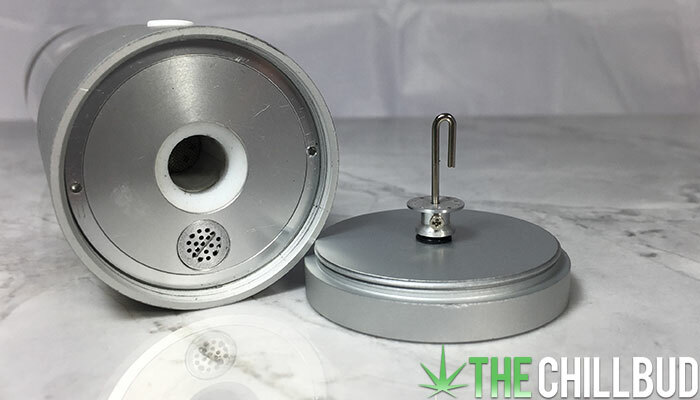 The dial is attached to a small metal hook that sits in the middle of the oven, turning the dial as you vape ensures an even heat distribution and total herb vaporization with no down time. Seemingly simple, but pure genius! 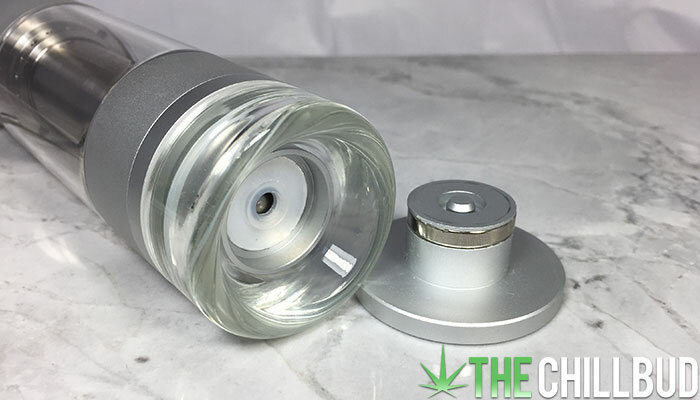 The mouthpiece on the Hydrology 9 is very similar to a glass bong. Your mouth sits inside the mouthpiece as opposed to pursing your lips around a nozzle. 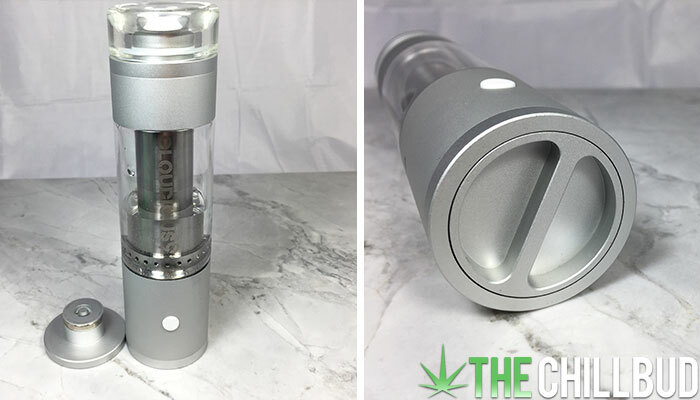 Cloudious 9 used plenty of glass and metal to create the Hydrology 9, giving it a solid and luxurious feel at the cost of it weighing quite a bit compared to other portable vaporizers. 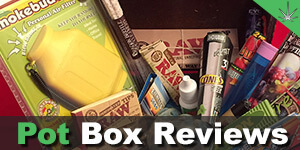 Again, this isn’t a vaporizer you’d take out for a hike, it’s more of an untethered at home vaporizer in my opinion. The workmanship on this vaporizer is top notch! 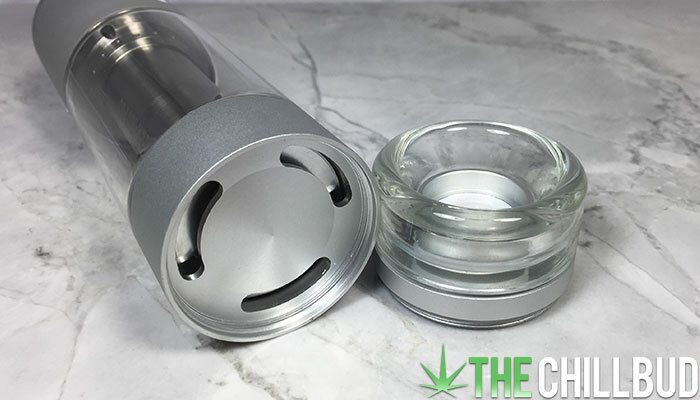 While it does have a magnet for the mouthpiece cap, the rest of the vaporizer uses threading to keep it together. I’m a huge fan of magnets and always want to see more, but the threading is phenomenally smooth so I’ll overlook my lust for magnets. Aesthetically this is one of the prettiest vaporizers I’ve laid eyes on. It’s different than anything else, a wonderful combination of a clean luxurious design with a touch of a futuristic sci-fi feel. Vapor quality was great! Not only was it extremely cool (due to the water filtration system), but I was able to get robust pulls every time. It also scored points for being really efficient. Once the Hydrology 9 is filled with water it’s extremely simple to use. A quick 3-clicks of the power button turns the unit either on or off, and 1-click will cycle through the 5 different heat settings. Attention to detail is evident in the build quality and in the quality of life features built into the design. 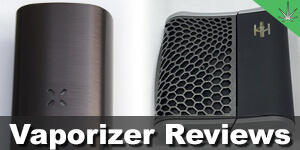 It’s as if whoever designed this vaporizer is a vaporizer enthusiast themselves! Having to open the oven and stir things around is a pain, but this is history with the addition of the built in stir stick. The air intake vents, the materials used, how well everything fits together, it’s all awesome! 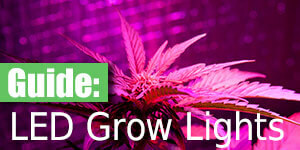 Size and weight would be a major drawback for many people in the market for a portable vaporizer. 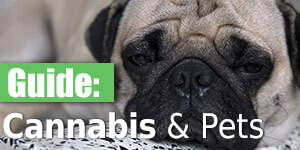 As someone who primarily uses their vaporizer at home or at the office, the size and weight didn’t affect me much at all. Even after adjusting the vents and water level I found I wasn’t quite able to reach the perfect draw resistance. One of the intake vents is also located on the base beside the power button, the very same area where I like to hold the vaporizer. This means I had to be aware of where my hand was as to not cover the vent and make it virtually impossible to pull from. After a few minutes the vaporizer will enter standby mode, requiring the user to press the power button once to let it know you aren’t done yet. This is a relatively common feature, my issue it that it seems to happen too often. I had to exit standby mode two or three times before the session was finished. 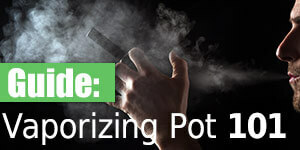 The hand-held vaporizer market was starting to get a bit stagnant despite the number of companies entering the market. Everything was pretty much the same, with very little innovation. The introduction of the Hydrology 9 is so exciting to me because it is pushing the limits, ushering in the new generation of herbal vaporizers. 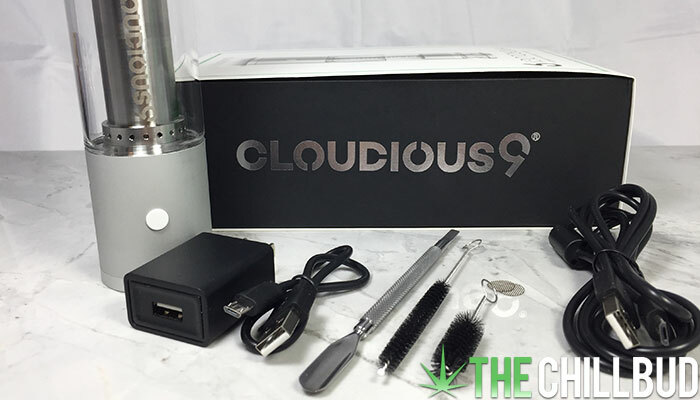 Cloudious 9 is leading the charge for a new wave of vaporizer technology, and so far we’re in love! If you are a vaporizer geek that wants to have the latest and greatest unit on the market, you’ll want to get your hands on the Hydrology 9. No it isn’t perfect, but it’s damn close! Totally unique design and high quality build.